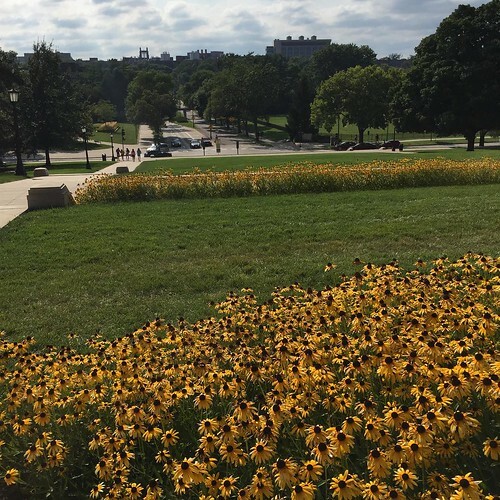 I drove four hours straight from Chicago to get to Iowa City yesterday, and I swear I got a tan on my arms because the sun was out in full glory and the temperature was almost as hot as it gets in Singapore. This last gasp of summer that I've caught in Chicago and Iowa City has been quite splendid indeed. While reading in an al fresco area of a cafe today, I kept getting distracted by the insects that were flitting in and out of the planter box beside me. That said, there was a massive thunderstorm in Chicago a few nights ago when I was there, not to mention tornado warnings. So I've downloaded Weather Bug on my phone and recalibrated my brain to understand Fahrenheit again. I don't know why I'm talking about the weather so much, except that maybe during the four years I spent in Chicago, I remember it being mostly grey and cold (which wasn't necessarily a bad thing), and all this sunshine and warmth is such a revelation. Also, as I told everyone before I left Singapore last weekend, it'll be such a novelty not to perspire for a few months. Tomorrow, the International Writers Program that I'm here for kicks off proper. Our first activity is a walking tour, so I hope the weather holds. Here goes!